Lake City, PA October, 2011 — The international Professional Landcare Network Association known as PLANET recently recognized Affiliated Grounds Maintenance Group, Inc., (‘AGMG’), a national exterior maintenance service company, for their consistent demonstration and commitment to safety from January 1, 2010 through December 31, 2010. AGMG has been honored in previous years for excellence in safety however this is the company’s first gold performance level award. With 3,600 PLANET member businesses and affiliates, only 45 companies received the Overall Safety Award Achievement Gold Level this year which honors businesses who demonstrate thorough, high–performing, safety programs that create and maintain safe work environments in the green industry. “Safety is paramount to our company and I am honored to receive the highest level in safety awards from PLANET,” said Crystal Arlington, CSP, LICM, who was present to accept the prestigious award at the annual GIE Expo and Conference held in Louisville, Kentucky October 26th through October 29th, 2011. 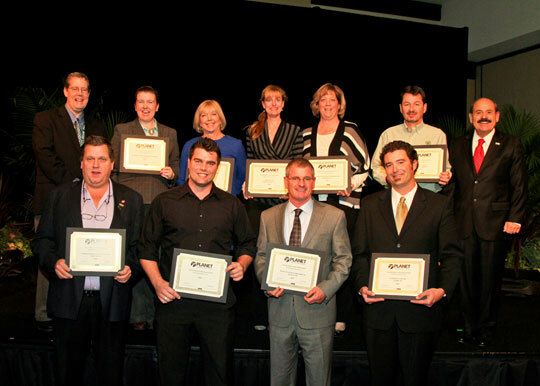 AGMG CEO/President Crystal Arlington (top row, 2nd person) receives the Overall Safety Award Achievement Gold Level at this year’s GIE Expo and Conference. AGMG’s Business Manager and Consultant, Richard Arlington, (bottom row, left) also received the award on behalf of his company Arlington Lawncare. Photo by: Philippe Nobile Photography, courtesy ofPLANET. For more information on Affiliated Grounds Maintenance Group, Inc., visit www.agmgus.com or call (866) 923-AGMG. The Professional Landcare Network known as PLANET is an international association serving lawn care professionals, landscape management, design/build/installation professionals and interior plantscapers. For more on the PLANET Safety Award, visit www.landcarenetwork.org.